If you have decided to rent a chateau on the banks of the Loire for your holidays, then we highly recommend visiting Saumur, a beautiful town that has lots to offer. The Cadre Noir, France’s elite national riding school, has strongly contributed to Saumur’s reputation. Saumur is the third biggest town in the Maine-et-Loire department in the Loire Valley, located in the heart of the Loire-Anjou-Touraine nature park. You can take a behind the scenes tour of the Cadre Noir guided by the ecuyers (riding masters), or enjoy a truly magical gala performance. 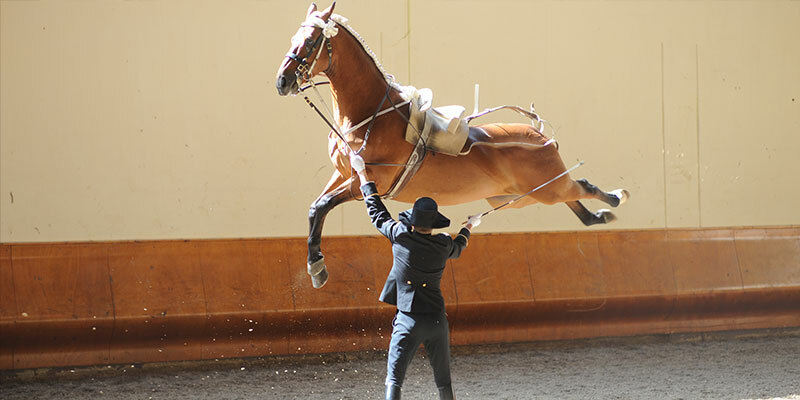 The Musée de la Cavalerie cavalry museum is housed in the former stables of the Cadre Noir. It boasts an impressive collection of armour and harnesses which provide insight into the history of the cavalry, from 1445 to the present day. The Musée des Blindés tank museum has the only collection of its kind in Europe. The museum contains no less than 800 tanks, 200 of which are on display and have been impressively well restored. For a totally different theme, visit the Musée du Champignon mushroom museum. Anjou is famous for its troglodyte caves. Head underground to find out all about Saumur’s mushroom growing industry. The museum contains 500 species, such as oyster mushrooms, wood blewits and button mushrooms. Saumur is located in a wine-growing region. Local vineyards produce red wine, rosé wine and sweet white wine. But Saumur is also home to Crémant de Loire and other fine sparkling wines. If you have ever wondered how wine is made, then you’ll enjoy a guided tour at one of the many wine producers. Sparkling wine makers Ackerman, Gratien-Meyer, Veuve Amiot and Bouvet-Ladubay are just some of the well-known names in Saumur. As well as its wines, Saumur is also home to the Distillerie Combier. Take a guided visit round the distillery to admire the stills which date from 1901, find out how their liqueurs, plant-based absinthes and other drinks are made, and, of course, there’s a taster session at the end of the visit. Leave Saumur for the neighbouring town of Doué-la-Fontaine twenty minutes away, and head to the Bioparc zoo. The park is strongly focused on saving endangered species. The zoo has 1,000 animals including okapis, rhinos, red bear cats and a collection of macaws. It is a great family day out, and you can either eat at the restaurant overlooking the giraffe enclosure or make use of the picnic facilities provided. If it’s good food you’re after, there are many excellent restaurants to be found in Anjou. But if you want to get an authentic taste of Saumur’s local culture, there’s no better way than to enjoy lunch or dinner at a troglodyte restaurant. The troglodyte caves, carved into the rock face, create an authentic and inviting setting which is perfect for tasting the local speciality, known as fouée – a kiln-baked bread roll often filled with rillettes, a type of pâté. If you are spending your holidays in and around Saumur at a rental property on the banks of the Loire, then visiting some of the region’s chateaux is a must. Saumur castle is an obvious starting point, but it’s not the only one worth visiting. Others include the Chateau de Brézé, which has a network of underground tunnels, the Chateau de Montsoreau which is built on the riverbed of the Loire, or the Chateau de Villandry which has fabulous landscaped gardens. France is considered by many to be one of the most beautiful countries in the world. If you’re luckily enough to have time to spend in this country, you definitely have to visit an another region, either far or close. How about finding and renting a chateau in France?